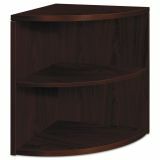 HON 10500 Series Two-Shelf End Cap Bookshelf, 24w x 24d x 29-1/2h, Mahogany - 10500 Series laminate desks from HON excels at the fundamentals. This versatile, bestselling collection features clean, straightforward styling that sets a professional tone. Beneath the surface, the 10500 Series is the best-built product in its price class. Strong, inner-frame construction and metal-to-metal joinery ensure a lifetime of peak performance. 10500 Series can easily create everything from ultra-compact single workspaces to extensive management suites to a network of interlinked stations. The three basic desk styles are 3/4 pedestal, full pedestal and modular shells with personalized storage. Other options include overhead hutches, wardrobes, bookcases, lateral files, reception stations and conference tables. Most components ship fully assembled. 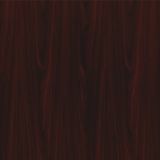 The wear-resistant laminate are available in dozens of woodgrain, solid or patterned combinations. Cord management grommets are included, and all drawers feature removable lock cores that can be changed on location. For premium quality on a moderate budget, 10500 is the solution.